1 Rinse cauliflower, drain and cut florets into 1 cm (approximately 1/2-inch) pieces. Rinse zucchini and wipe dry. Peel carrots. Rinse cucumber and wipe dry. Peel shallots. Scoop seeds from pumpkin piece. Cut all vegetables into 1 cm (approximately 1/2-inch) pieces. 2 Place vegetables in a large bowl and mix with salt. Cover bowl with plastic wrap and let stand overnight. 3 Rinse jars (each about 250 ml) (each approximately 8 ounces) and their matching lids in boiling water, then leave jars upside down to dry on a kitchen towel. Drain salted vegetables well. 4 Mix together mustard powder, turmeric, pastry flour, white pepper and ground ginger in a pot. Add just enough vinegar to make a smooth paste. 5 Stir remaining vinegar into pot. Add vegetables with about 100 ml (approximately 4 ounces) water and cook, stirring occasionally, over medium heat. 6 Once mixture begins to thicken, continue to cook for another 5 minutes, stirring. 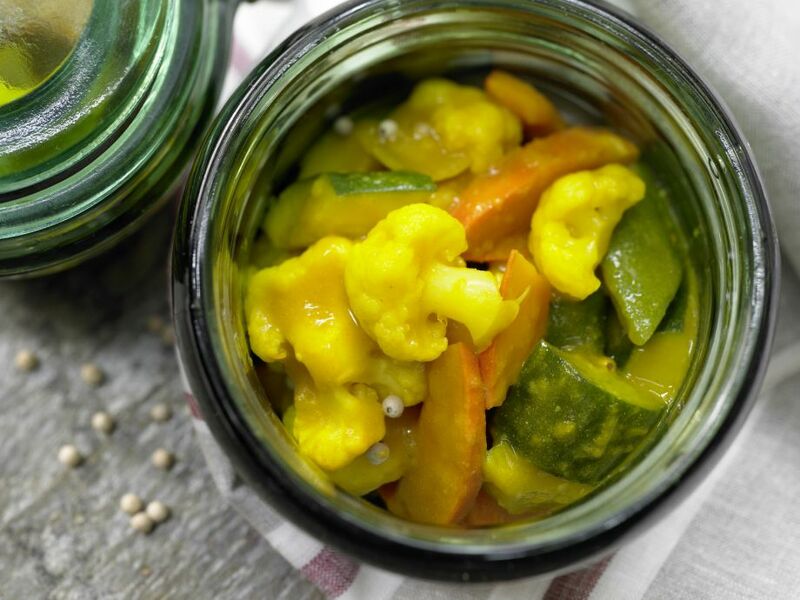 Divide hot vegetable mixture among prepared jars and secure lids. Place upside down for 5 minutes, then turn right side up and let cool completely. Refrigerate for up to 2 weeks. Tip: To preserve for longer, process jars according to manufacturer's instructions (or visit http://nchfp.uga.edu/).